Convocation Hall of the University, Bombay. bl.uk > Online Gallery Home	> Online exhibitions	> Asia, Pacific and Africa Collections	> Convocation Hall of the University, Bombay. Photograph of the Convocation Hall in Bombay (Mumbai) from the Archaeological Survey of India Collections: India Office Series, taken by an unknown photographer in 1874. The majority of Bombay's buildings were designed by architects living and working in the city. 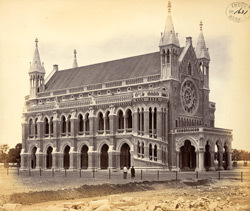 However, the Bombay University complex, consisting of two separate buildings: the Library (built 1869-78) and the Convocation Hall (built 1869-74), were designed by Sir George Gilbert Scott from his office in London. The Convocation Hall was designed and built in the Decorated French style of the 15th century. It was funded by the Parsi philanthropist Sir Cowasji Jehangir Readymoney and has a beautiful circular stained glass window, with a design of the signs of the Zodiac. The building was in the final stages of completion when this photograph was taken and there are traces of building work visible in the foreground.